It makes businesses sound scientific - but are all companies really unique? In our post-Darwinian commercial rhapsody it is unsurprising that this metaphor should have taken root in consultant-speak, but the idea owes nothing to science. It seems to denote unique aspects of corporate culture that executives might want to use to advantage, or reproduce. 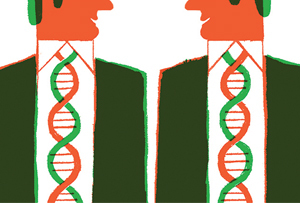 Of course, real DNA produces exact copies of itself, plus a set of instructions about how to build an organism, whereas even strong organisational cultures struggle to replicate anything, and find it very hard to stay the same in a changing world. The idea that companies have anything unique about them (apart from the biological organisms running them) is specious. But the people do make the place, so there you are: real DNA in human form, especially in its leaders, is what makes a business unique, although in many companies having a 'DNA'-badged set of values looks, paradoxically, as if they actually want to eliminate the awkward perturbations brought on by letting real people have their voice.